Looseness of the top or back of an instrument can easily cause a sympathetic mechanical buzz. It's so easy to see that it needs structural repair, there's probably no reason to even listen to hear if the damaged area makes any unwanted noises. Most of the time, a buzzing loose top or back is very much more subtle. You can't really see it at all. You usually can hear it if you rap with your knuckles around all the edges. You'll hear a "cracking" or "flapping" sound as you rap on the loose spot. That's what we hope for, anyway. Sometimes it's even more subtle than that and you must probe around inside to see if there are any places where a thin blade palette knife will slip between the lining and the top or back. The most insidious of all is the "under-the-arm-loose-top." There, the top is held from vibrating by the player's arm. Some players will hold their arm against a different portion of the top, so the buzz may occur only when certain musicians play the instrument. As if life wasn't complicated enough already! 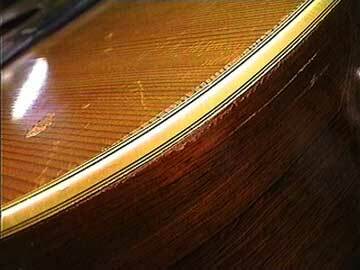 Under the arm is a good place to look for a loose top because the heat from the player's arm can weaken the glue joint after enough repeated exposure, especially on very old instruments. Violinists see this problem a lot because they jam their instruments right under their chins! Fortunately, though, they usually have a chinrest which acts as clamp to hold things together. The cure for the loose top or back is obvious enough - reglue it.